Remember the Leibolds On the left??? Remember the Engells on the right??? Hi Myrna (Bilton). I wanted to give you a bit of an update. Lo and behold, some familiar folks with a Canadian accent showed up at our place one day. They are staying at a neighbouring park here in south Texas. 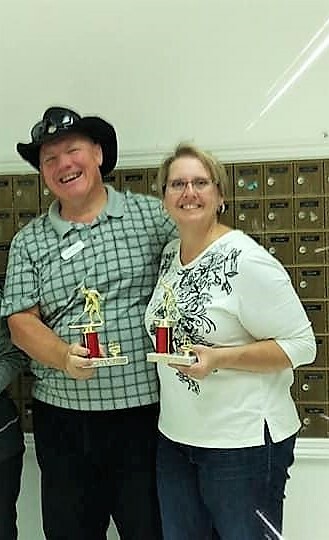 Last week, in a Texas State Tournament, Marie and Barry (Leibold) placed first in main in mixed doubles amateurs while Ann and I placed fourth in consolation in experts. 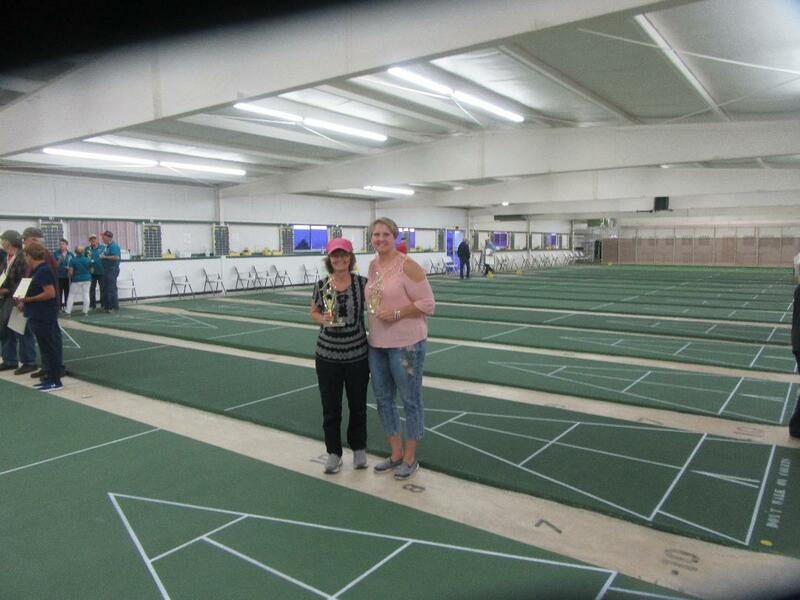 Then, last week, in another singles State amateur tournament, Marie placed first in main while Ann placed third in main. Ann and Marie are teaming up in a doubles tournament next week while Barry and I are teaming up in a doubles tournament the following week. I suspect we’ll have problems crossing back into Canada with all this hardware. lol. Great to see you having fun. Oh my goodness, I had a long article written here the other day and lost it all before I got it posted. So I’ll try again, if anyone is interested. With the large numbers of shufflers in TX tournaments the format of one, 20-frame game began many years ago and continues today, even though tournament player numbers have declined, as every where. 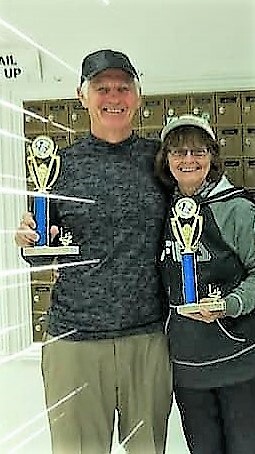 In Singles & Doubles tournaments, the Ladies, both Expert & Amateur play on Tuesdays and the Men Expert & Amateurs play on Wednesdays w/the finals for all on Thursdays. In Mixed-Doubles the Amateurs, both men and ladies, play on Tuesdays and the Experts, both men & ladies, play on Wednesdays w/the finals for all on Thursdays. On the first day of tournaments, whether Tues. or Wed., all shufflers gather at the Host park and are sent out to near-by parks to accommodate everyone. Two 20-frame games are played before lunch. At lunch time all players return to the Host park for lunch provided by the Host park. After lunch the Host park is usually able to accommodate the remainder of the players for 2 or sometimes 3 more games . . if not, some shufflers are sent to another park for the 3rd game. A 20-frame game, 10 frames on each color can be completed in approx. and hour and a half, so everyone finishes around the same time. Color choice in a 20-frame game is determined by a coin toss. Winning the toss almost always means choosing Black first as to get the first and last hammer of the game. Although, loosing the toss and beginning on Yellow is not the end of the world because you get two hammers in a row at mid point of the game. That’s the way it’s played in TX! If you have any questions just let me know.